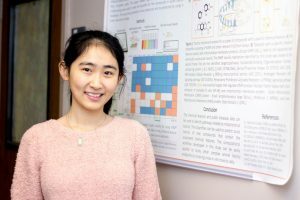 The research of Wenyi Wang, a doctoral student in the computational and integrative biology program, has won many accolades, including an award at a national conference. After arriving on campus, it was clear to Wenyi that computational biology was a great fit for her. “I am so grateful that I chose this research area. This is the best choice I ever made,” she says. At first, Wenyi began working on a training project, and learning the fundamentals of cheminformatics research while doing publishable work. As a result of the publication from this project in 2015, Wenyi won second place for the Best Student Paper Award from the Center for Computational and Integrative Biology in the same year. Mentored by Dr. Zhu and Marlene Kim, a senior student in Dr. Zhu’s lab who is a 2016 doctoral graduate of the computational and integrative biology program who now works as a researcher for the Food and Drug Administration, Wenyi began to write the code to help Marlene with the project that Marlene was then working on. This simple start became the origin of the project “Mechanistic evaluation of chemicals that induce oral acute toxicity from mitochondrial membrane disruption: big data profiling and analysis,” which assesses chemical animal toxicity through computer modeling. It was eventually featured in Environmental Health Perspectives, the top journal of environmental science. By developing a computational tool that could extract and examine data related to animal toxicity, Wenyi and her colleagues were able to detect potential toxicity mechanisms by linking the chemical and biological profiles to cellular response and the respective hazard. Dr. Hao Zhu leads the Center for Computational and Integrative Biology’s Cheminformatics Lab. Wenyi’s new project, titled “Predicting Nano-bio Interactions by Integrating Nanoparticle Libraries and Quantitative Nanostructure Activity Relationship Modeling” achieved great success and attracted attention worldwide. Wenyi successfully developed a new method to simulate nanomaterials virtually in computers. This approach will help experimental nanoscientists to know the potential bioactivities of new nanomaterials before even synthesizing them. Because of this study, Dr. Zhu was invited to give a keynote address, titled “Quantitative Nano-structure Toxicity Relationship: Developing Predictive Cell Recognition Models for Gold Nanoparticles,” at the 33rd International Conference of the Society for Environmental Geochemistry and Health in June 2017. In November 2017, the research paper that resulted from this project was accepted by ACS Nano, one of the leading chemistry journals. Currently Dr. Zhu is collaborating on the project with four professors, including Dr. LiQin Tan, Professor of Art at Rutgers–Camden, with their research groups in China and the United States. This international collaborative project, which was initiated by Wenyi, represents great potentials of funding opportunities. While Wenyi prepares for graduation in October 2018 and works on her dissertation with a focus on both computational toxicology and computational modeling of nanoparticles, she will transfer both projects to two new students whom she will mentor. A key part of Dr. Zhu’s lab’s success is for students to train other students. 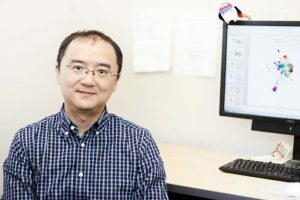 Such collaboration and mentorships will help to “grow and strengthen the computational and integrative biology program,” says Dr. Zhu. Indeed, collaboration is the key to all the successful projects. As Wenyi looks back at her time at Rutgers–Camden, she says that “coming all the way from China to here was my best choice ever. It totally changed my life. I am so proud to be a student of Dr. Zhu’s and so proud to be a Rutgers student.” Undoubtedly, Rutgers-Camden is proud to have a student such as Wenyi Wang and a professor such as Dr. Zhu. Page last updated by Faculty of Arts and Sciences at 9:31 am July 11, 2018 . This page was printed from http://fas.camden.rutgers.edu/2017/11/28/we-r-arts-and-sciences-wenyi-wang-and-dr-hao-zhu/ at 7:06 AM Monday, April 22, 2019.